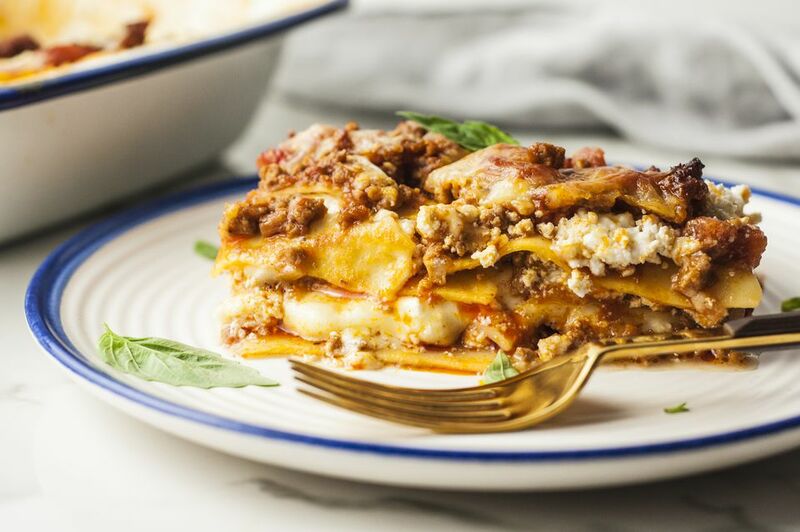 This classic recipe for basic lasagna is made with a homemade meaty tomato sauce and layers of cheese and lasagna noodles. Note: while there are multiple steps to this recipe, this lasagna dish is broken down into workable categories to help you better plan for cooking. Start the sauce about 30 to 45 minutes in advance. In a large deep saucepan over medium heat, sauté the onion and garlic in 3 tablespoons of olive oil until onions are soft. Add the ground beef and brown, stirring frequently. Pour off excess fat. Add the tomatoes, tomato paste, 2 teaspoons salt, cayenne pepper, sugar, basil, bay leaf, and 2 cups of water; stir well. Reduce heat to low and simmer slowly, uncovered, for 1 hour, or until the sauce has thickened. Bring a stockpot full of water to a rolling boil. Add salt, drop in the whole lasagna noodles, and cook as the package directs, stirring frequently to prevent sticking. Drain; toss gently with 1 tablespoon of olive oil. Spoon 4 to 6 tablespoons of the sauce or just enough to cover the bottom of a large 3-quart rectangular baking dish. Top with a single layer of noodles. Spoon about 1/3 of the remaining sauce over the noodles. Spoon about 1/2 of the ricotta cheese evenly over the layer of sauce, then sprinkle a few tablespoons of Parmesan cheese over that. Add and about 1/3 of the mozzarella cheese. Repeat with another 1/3 of noodles, another 1/3 of the sauce, the remaining ricotta, another 1/3 of the mozzarella and a few tablespoons of Parmesan cheese. Finish with the last layer of noodles, the remaining sauce, Parmesan, and mozzarella cheese. Bake the lasagna, uncovered, for 45 minutes. If the top is browning too fast or the noodles are burning, cover loosely with aluminum foil. Remove from oven and let cool 10 minutes before slicing into squares and serving. Lasagna can be frozen after it is baked and cooled, or before it is baked. To avoid a watery end product, make sure the casserole dish is frozen in as airtight a package as possible. Thawing before reheating or cooking often leads to a watery dish. Cooking directly from the frozen state is advised, whether the lasagna has already been cooked or not. Just heat the oven to 350 F, cover the top of the lasagna loosely with foil so it doesn't brown too quickly, and bake for 45 minutes. Remove the foil and bake an additional 15 minutes or until bubbly hot (uncooked frozen lasagna will take longer). If you prefer a vegetarian lasagna, try this tried-and-true spinach lasagna. This spicy chicken lasagna is another excellent alternative featuring Tex-Mex flavor and chicken instead of beef.